Get two months of free online learning in new skills and feel empowered to become the creative you’d always hoped to be. Got a winning idea for an app, children’s book or new business venture? Or do you want to diversify your skillset to help you aim big in your next career move? Whatever your dream, stop thinking about it and go for it, with two months of free Skillshare Premium courses to empower you with the expertise you need to see it through. As illustrator Eva-Lotta Lamm says in our Why you should make time for creative side projects feature: “My advice is to just start doing something that interests you and see where it will take you.” Her sketchnotes began as an illustrated travel diary and grew into her main career as she was booked for speaking engagements and teaching workshops. “Personal projects for me are important because they act as a beacon for what I'm about,” Brendan Dawes told us in our recent interview with him, adding that the attention from personal projects can help to get your name out there. Could that great idea of yours be the key to landing a job at a top design studio, or running a successful side business? Numerous creatives like Lamm and Dawes have had success with their passion projects, but they also all had to start somewhere. You may already have design qualifications and be a Photoshop pro or a web design whiz, but still have an area where you feel less confident or have a professional gap. Or you may have a burgeoning interest in a discipline that’s new to you. Learning these skills could see you progress up the career ladder faster, and help future-proof your career at a time when flexible, eager and multi-talented creatives are in demand. If you’d like to learn new skills or make improvements in anything from logo design and typography, to crafting a standout portfolio site and pitching your skills as a freelancer, Skillshare has a course to help. Its courses are taught by working professionals with core expertise in each field they teach about, so you know you’re in capable hands. Learning from passionate creatives will empower you to be the designer or artist you’ve always wanted to be. As well as driven teachers, every Skillshare class involves other students by having you learn together, exchange feedback and showcase work. 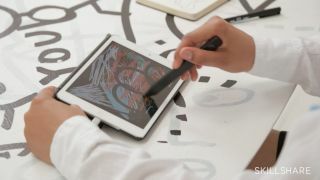 Have a look at the student projects on the Skillshare site now, to see what you could be creating. If you're looking to freelance outside of work, launch a side hustle, improve your skillsets at work, or pursue a personal passion project, check out the courses for creatives at Skillshare. Click here to redeem two whole months of Skillshare Premium membership for free. That’s two months to try over 17,000 classes - which will you choose?